Many of you have asked about my new puppy, so here is my report. 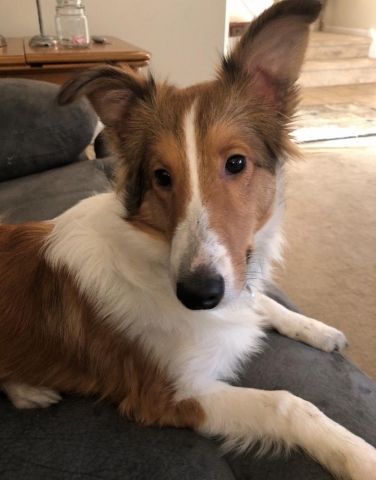 In case you don't already know this, I adopted a rescue sheltie puppy a couple of months ago. He's now about seven months old, and he's extremely cute, and sweet, and cuddly. Which is a darn good thing because, as Ruth Portzline describes him, he's a "stinker." Ollie is my fourth sheltie. I've never had a sheltie who chews anything in sight and who digs holes all over the place. I know both of those things sound like normal dog behavior, but having had three other shelties, I assumed that this was a breed that did not chew and dig. Silly me. So far I've lost at least a dozen socks (I know, I know ... stop leaving your socks around ...), two blankets (the second one was brand new and had a hole in it within 5 minutes ... ugh ...), and a couple of ottomans that got pulled apart one Sunday morning while I was at church. I ALSO have to sweep and mop the floors daily (and clean the carpets a couple times a week) due to the mulch and mud that makes it way into the house via the doggie door. Plus I have a growing collection of muddy rocks and stones that have been carried into the house and dropped at my feet. Like I said, it's good thing he's cute, cuddly, and lovable! Don't you often wonder how it is we're able to interact with our pets - dogs, cats, parakeets, hamsters, you name it (of course, dogs are the best lol)? It seems that God has somehow programmed His creatures to develop certain types of relationships that actually enhance one another's lives. We can't quite grasp the way they think, although we're usually able to comprehend the things that are important to them. And I suspect they have a general understanding of what is important to us. And, most importantly, they enjoy our company and we enjoy their company. It's a win-win. And I'm so happy to have been able to rescue one of God's wonderful creatures.